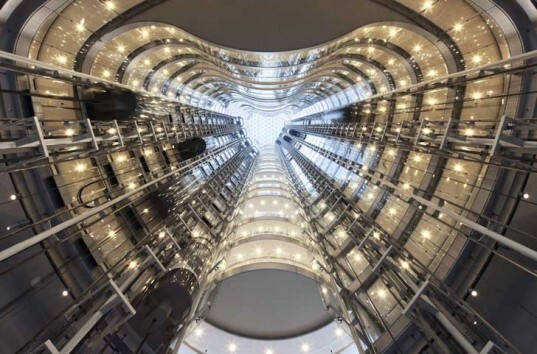 Ingenhoven Architects + Architectus recently unveiled a brand new glass high-rise in downtown Sydney that has earned the highest score in Australia’s Green Star standard. Inaugurated by Australian Prime Minister Julia Gillard and commissioned by the Dexus Property Group, the 1 Bligh office tower glows from within with 28 story-high atrium that stretches from the building's lobby to a massive skylight up top. The floor-to-ceiling atrium also acts as a natural cooling system, siphoning hot air and funneling it out the top of the building. Office balconies line the interior of the atrium, benefitting from the breeze and natural light. The shape and design of the building is based on solar orientation – the layout creates advantageous shady and sunny areas. Employees can enjoy harbor views from any height through the clear glass façade. An outdoor patio on floor 15 offers a place to have lunch with a view. The entire roof is a green planted terrace accessible from the 28th floor that offers superior harbor and city views, fresh air, and greenery. The roof deck is also partially covered so employees can still enjoy it in rain. The soil and greenery on the roof cuts down on the building’s solar gain. The double skinned façade glitters in Sydney’s skyline, while cooling the inside. The building is partially powered by a vacuum tube solar collector. Sydney frequently experiences water issues, so the building has an on-site wastewater recycling system that is so prolific it recycles some public sewage system water as well. On-site bicycle parking encourages employees to take green transportation to work.